It’s nearly Valentine’s Day, and this year, there’s real reason to rejoice: news just broke that there is another installment of my favorite guilty pleasure, Bridget Jones, in the works. The third book in the series is due to hit shelves late 2013! When it comes to novels about love and romance, one’s mind might naturally wander to Nicholas Sparks. Don’t get me wrong, like any girl, I’ll rarely pass by The Notebook when the movie adaptation of this book plays on Lifetime. I love, for example, that so many of his novels acknowledge the romance of southern culture, but, to me, many of his plots often feel contrived. I’ve never fallen in love with one of his characters. And while, certainly entertaining (and always the perfect choice when I need a good cry), I’ve never laughed out loud when reading Nicholas Sparks. Bridget Jones’s Diary, (a modern version of Austen’s Pride and Prejudice), on the other hand, offers readers romance that is funny and witty. While the plot may not offer many surprises (Bridget does, in true Austen fashion, get her happy ending after much trouble), she is such a refreshing and honest voice that all is forgiven. Bridget is likeable despite her many, many imperfections. She is on a perpetual quest for self improvement; she vows time and time again to quit smoking, lose weight, get a respectable career, stop talking nonsense, and of course, get the guy(s). Nearly every effort fails and we love her for that. It’s relatable. If she isn’t us, she’s our friend, coworker, sister. Not surprisingly, I’m able to find a little of myself in this protagonist. Case and point: It’s her birthday and Bridget decides (despite the lack of proof) that she possesses undiscovered culinary talent, and thus spends all day slaving in the kitchen. The result: “After all effort and expense, have served my guests: Blue soup, omelette, and marmalade. Am disastrous failure.” The effort is not in vain, however, when Mark Darcy, a guest at the dinner, is able to see the humor in the situation. Of it she writes, “Love my lovely friends. Were more than sporting about the blue soup” (237). So while our girl Bridg has the corner on blue food, I’d like to grab a foothold on pink food. 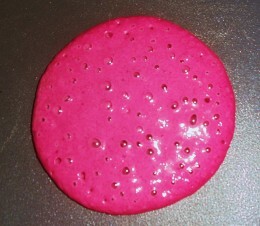 Beet pancakes are not only healthy (something Bridget would, no doubt, appreciate when she’s on one of her many diets), but they are a perfect shade of pink. Pour them in a heart shape, or use a cookie cutter, and they’re ideal for a romantic Valentine’s Day breakfast. 1. Begin by roasting beets. (Wrap each beet in tin foil and bake at 400 degrees for about an hour or until you can easily pierce with a fork). The skin should peel right off. Puree in a blender or food processer. Allow to cool. 4. Add the dry ingredients to the wet; do not over mix. 5. Pour pancake batter onto a hot, non-stick pan or griddle. When bubbles begin to pop, it’s time to flip them. This entry was posted in Breakfast, Bridget Jones's Diary, Healthy alternatives, Holiday dishes, Vegetarian and tagged beet pancakes, book reviews, books, breakfast foods, bridget jones's diary, healthy recipes, new bridget jones book, recipe for beet pancakes, Recipes, recipes using beets, valentines day, valentines day recipes, whole wheat beet pancakes. Bookmark the permalink. If these are as good as your pumpkin pancakes, you’ve got a winner. Did you even know that you wrote this on National Pancake Day? I thought national pancake day was on Monday (we had blueberry pancakes in celebration of that important day). They are good…but then again, what isn’t on this griddle!